A 17-year-old male has been charged with four counts of first-degree murder following a mass shooting that left four people dead in La Loche, Sask. At a press conference on Saturday, RCMP Supt. Grant St. Germaine said that the suspect, who can't be identified under the Youth Criminal Justice Act, has been charged with four counts of first-degree murder, seven counts of attempted murder and a single count of unauthorized possession of a firearm. "It is a significant event for Canada," said St. Germaine. The suspect is scheduled to make his first court appearance next week. 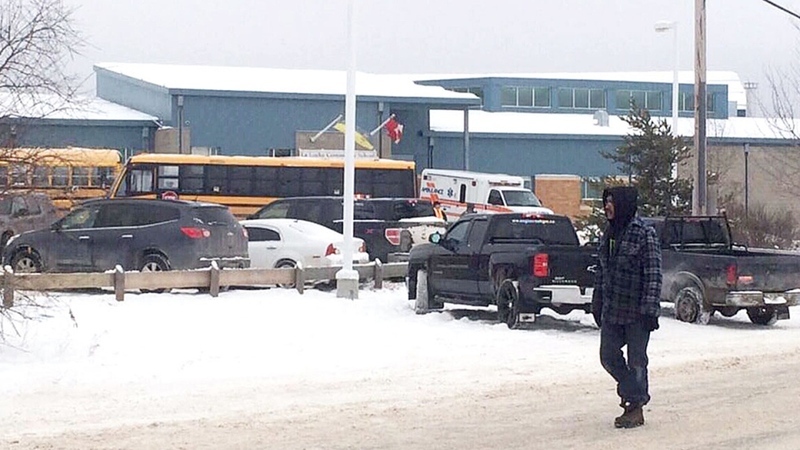 St. Germaine said that authorities received calls from teachers and students at the La Loche Community School on Friday at about 1 p.m. saying that a person was "discharging a firearm at people in the school." When police arrived, the school's front door had damage consistent with the discharge of a firearm. Police then tracked down the suspect and pursued him through the school. St. Germaine said that at 1:15 p.m., the armed suspect was taken into custody, and no one was injured during the arrest. 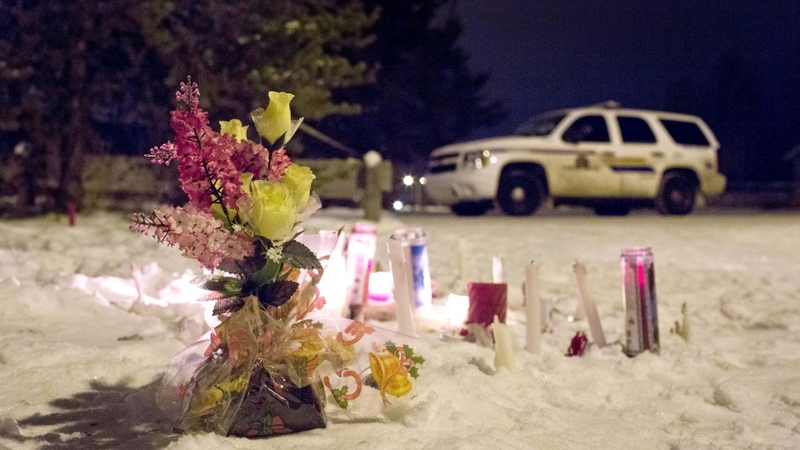 Police then went to a home, where Dayne Fontaine, 17, and Drayden Fontaine, 13, were found dead. Both locations remained under police control on Saturday, as specialized investigators gather evidence. St. Germaine said police are not aware of any motive at this time. Earlier Saturday, a teacher and a tutor were identified as two of the victims of shooting at the school. 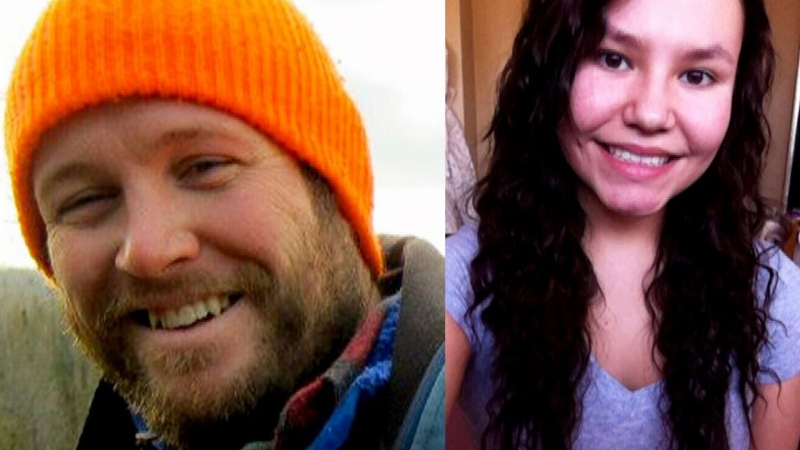 Family members confirmed to CTV News that Adam Wood, 35, a new teacher, and Marie Janvier, a 21-year-old tutor, were both killed when the gunman stormed Dene High School on Friday afternoon. According to a statement from his family, Wood was originally from Uxbridge, Ont. His family said he moved to La Loche this past September to begin his teaching career, and was enjoying his experience there. "Adam was quite an adventurer, had a passion for life, and would make you laugh until your stomach hurt," the family said. "He was always up for a good challenge and lived each day joyously." Ashton Lemaigre, a friend of Janvier's, told the Canadian Press that the tutor was kind and patient with children. "The kids loved having her around," Lemaigre said. "When we were out and about kids would say 'Hi.' They would just come running to her. And she was just a friend to everybody." Wood and Janvier were two of four victims killed during the shooting on Friday. Police said that Janiver was found dead at the school, while Wood was transported to hospital, where he too, was declared deceased. "It is a very sad and difficult time, and no words will take away the pain and sorrow of what has happened," said St. Germaine. "We are deeply saddened by the loss of our community members -- we must get through this together." A total of nine people suffered gunshot wounds, and seven were initially taken to the La Loche Health Centre and Hospital. Four were then airlifted to the Royal University Hospital in Saskatoon, which is about 600 kilometres south of La Loche. St. Germaine said the other three will be transferred when "weather permits." At a news conference on Saturday, Saskatchewan Premier Brad Wall expressed his shock over Friday's tragic events. "To have the lives and the futures of these students and staff cut short by this unspeakably horrible event is unimaginable," said Wall. The premier also extended his "deepest condolences" to the friends and families of the victims, and said he was praying for a "swift recovery" for those wounded. Wall said that the province would to do its best to offer La Loche its assistance. 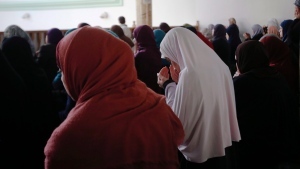 "Nothing will ever fully heal the loss of four lives, and the wound that was inflicted on an entire community, and really on an entire province," he said. "But that same province is going to be there for that community. For the victims and families to help them, in some way, deal with this terrible, terrible tragedy." 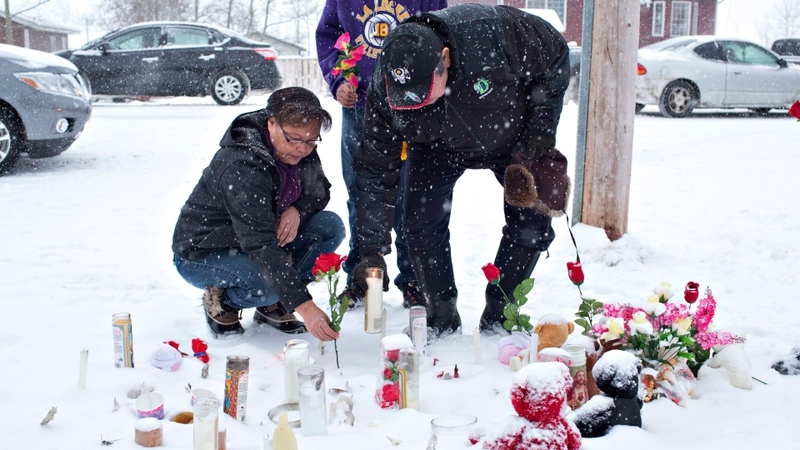 Four victim-services workers are also now in La Loche to help people deal with the trauma caused by the incident, and other mental-health services have been put in place. Wall said that the Meadow Lake Tribal Council, which represents nine First Nation band governments in Saskatchewan, has sent elders and counsellors to help with the efforts. The Saskatchewan premier is set to travel to the community on Sunday. He will be joined by Public Safety Minister Ralph Goodale, Assembly of First Nations National Chief Perry Bellegarde, as well as many other officials. In a statement, Bellegarde said his "thoughts and prayers" are with the people of La Loche, and committed to a thorough investigation, focusing on "relief for the community" and "prevention." "We must all work together to identify the needs, priorities and services required to prevent violence in our communities," said Bellegarde. "We stand with them, support them and will do whatever they ask to assist them during this difficult time." Family members confirmed to CTV News that Adam Wood and Marie Janvier, 21, were both killed when a gunman stormed Dene High School on Friday afternoon.